John Marshall responds to a recent article. 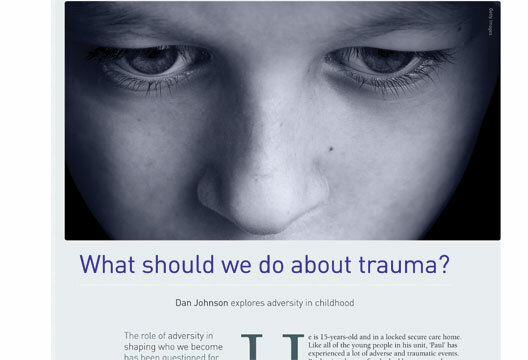 Dan Johnson’s article on adverse childhood experiences (ACEs) is a welcome précis of the importance of adversity in warping normative developmental trajectories (‘What should we do about trauma?’, June 2018). The term ACEs is becoming ubiquitous in child psychology, among service leaders and policymakers. At a recent forensic event I attended, speakers talked enthusiastically about ACEs as being primarily causal in serious violence – with no basis for such claims apart from their experience. At the time I mused about how many prosocial researchers and practitioners in the audience likely experienced ACEs. in psychological interventions (Poole et al. 2018). For children with neurodevelopmental disorders (NDDs), genetically informative studies focusing on ACEs as causal or contributing factors, are beginning to illuminate complex causal pathways, raising far more questions. A recent co-twin control study demonstrates paradoxically that, child maltreatment was not associated with an increased load for NDDs. This counterintuitive result perhaps indicated that co-occurrence of child maltreatment with NDDs seems to a large extent to be accounted for by a shared genetic liability, increasing both the risk of being maltreated and having more co-occurring NDDs (Dinkler et al. 2017). Dinkler, L. , Lundström, S. , Gajwani, R. et al. (2017), Maltreatment‐associated neurodevelopmental disorders: A co-twin control analysis. Journal of Child Psychology and Psychiatry, 58, 691–701. Poole, J.C. , Dobson, K.S. & Pusch, D. (2018). Do adverse childhood experiences predict adult interpersonal difficulties? Child Abuse and Neglect, 80, 123–133.